Book received at no charge from the publisher to facilitate review. Nothing much ever happened on the Tucker Farm. The cows go about chewing their cud, the hens peck and lay their eggs while the hound lays around on the porch. But things on the farm get crazy when a peacock shows up. The peacock struts about with his feather's spread and attracts the attention of folks just driving by. Soon they stop to admire him while they buy up all of the eggs, corn and milk. The hens can't help but notice how all of the peacock's prancing doesn't produce a single contribution to the roadside stand. They team up against him and demand that he stay back at the hen house and tend to the nests while they dress up for the glamorous job of stopping cars. Sadly, their antics fall short of their desired result. 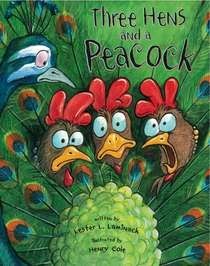 The hilarious illustrations will elicit giggles from young readers while they learn a valuable lesson on why each individual's contribution is important. The cartoon like expressions on the faces of the farm animals will charm children of all ages.